Next-years crop of flagship chipsets has been undergoing some vigorous testing over the past couple of months, and aside from the occasional leak, we've also been treated to credible benchmark results of the Snapdragon 820. Mediatek's high-end SoC Helio X20 (a.k.a. 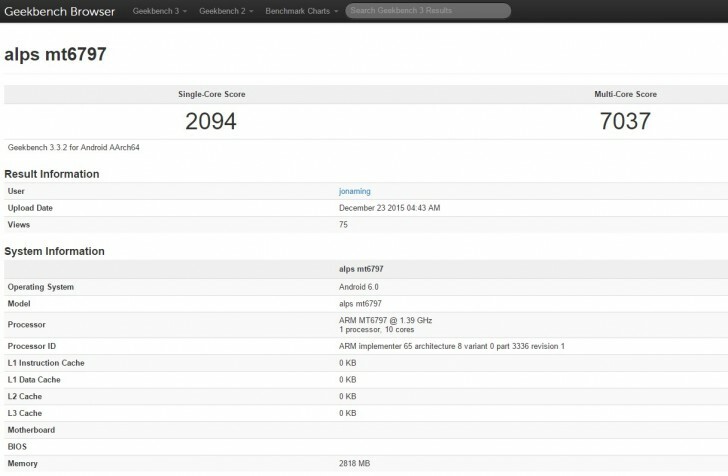 MT6797) hasn't been in the spotlight as much, but has just shown up on GeekBench posting some seriously good numbers. The multi-score result north of the 7,000 mark is far and away the highest score we've seen posted by a mobile chipset and in an actual listing on the benchmark's website. The Tri-cluster 10-core CPU architecture of the SoC, consisting of 2 Cortex-A72 cores and double quad-core Cortex-A53 is responsible for the record-breaking figures. However, a single Cortex-A72 isn't up to the standards of Apple's current Twister cores in the A9 chip, or Qualcomm's upcoming Kryo cores. The Helio X20's single-core performance is rated at a little over 2,000 units, while the above two can push upwards of 2,300-2,400. All that said, a previous chipset comparison had next-year's Exynos 8890 posting a mind-blowing 7,400 points, while the Helio X20 was trailing at 6,500. So until all of these SoC's end up in production devices, which we can test, the above numbers are nothing but a general indication of the direction the industry is headed. Lol. Any figures to back that up? A quick search proves you wrong. Mediatek is Taiwan's largest producer, but they only cracked the top 10 for the first time this year.